With the introduction of video-capable DSLRs from Nikon and Canon, a new workflow was needed to handle the files coming out of these cameras. Editing Nikon's MotionJPEG and Canon’s H.264 files straight out of the camera is doable, but not advised. The highly compressed files will tax your processor as it has to decompress on the fly sometimes causing erratic playback. If you wanted to mix and match with video footage, you had compatibility and time-consuming render issues. At the Los Angeles Times, we have Canon 5D Mark 2s, Canon 7Ds and Canon and Sony video cameras. We use Final Cut Express and Final Cut Pro and my original idea for this column was to come up with a workflow to share with my co-workers. One invaluable piece of software for all of this is MPEG Streamclip. It’s a wonderful application that allows you to convert footage from one codec to virtually anything. The best part is it’s free and it’s available in Mac or PC versions. Download from here: HYPERLINK "http://www.squared5.com" www.squared5.com. The following steps are for batch processing which is what most of you will be doing. Launch MPEG Streamclip and in the menu bar go to List > Batch List (Cmd-B). Leave unchecked “Join all files” and “Fix timecode breaks.” Click OK.
You’ll be presented with the Movie Exporter window. Now for the disclaimer. If you’re editing in Final Cut Express, you are extremely limited in your choice of codecs and frame rates. Express will recognize DV NTSC (standard def), Apple Intermediate Codec in 29.97 fps and 25 fps, not 24 fps. Everything else will have to be rendered out. Final Cut Pro will work with many, many more codecs and you’ll have less incompatibility issues. It’s pricey but worth it. In the exporter window, choose your compression method in the pulldown menu – Apple Intermediate Codec for FCE and anything else for FCP. 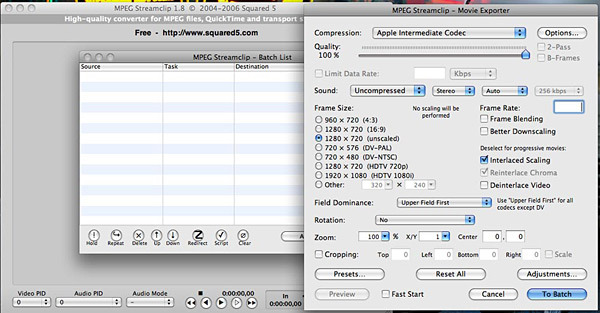 Many use Apple ProRes for FCP. One word of caution. Apple Intermediate Codec and Apple ProRes create huge files – 30 to 95 GB, respectively, for one hour of footage so make sure you have plenty of hard drive space before you start. Take the Quality slider to 100. In Frame Rate, change it if you need to otherwise leave it blank. Go find something interesting to do while it’s converting and come back to edit friendly footage.